The tapestry Abandoned Cottage on the Isle of Stroma, Caithness took Ben Hymers eight months to weave, and depicts a watercolour by His Royal Highness, The Prince Charles, Duke of Rothesay, painted in Scotland. HRH supported the project by generously giving permission for his watercolour to be translated by the apprentice. 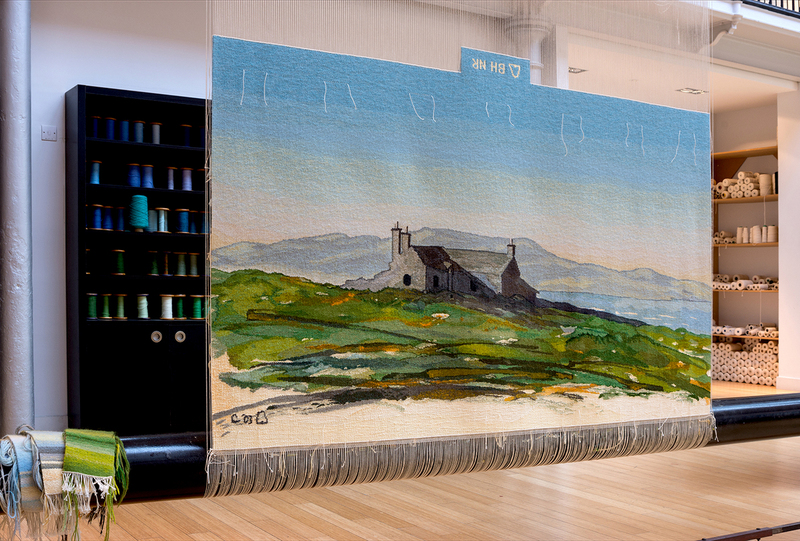 Dovecot Master Weaver Naomi Robertson supervised how Ben Hymers has interpreted the watercolour. His main challenge was how to ensure the colour palette in the tapestry would be a true depiction. In translating watercolour, the weaver has to create an element of translucence in wool colour, where the colour bleeds from one to another. Fine graduation of the blends featured in the sky above the cottage, was an area where Hymers was able to explore and advance the skills in weaving that he has developed over his past three years’ training. During the sampling stage, Hymers developed a catalogue of over 50 colour blends, depicting every tonal area of the watercolour scene.